Ah yes, most gripping drama indeed! 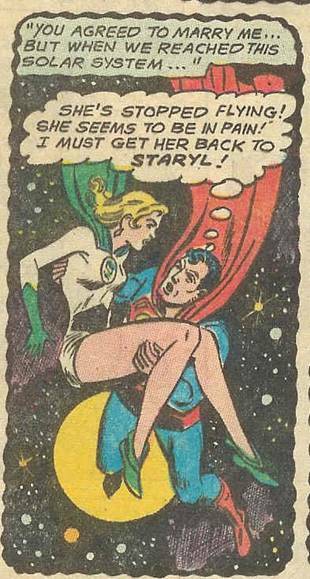 I can truly sympathize with Superman’s predicament. 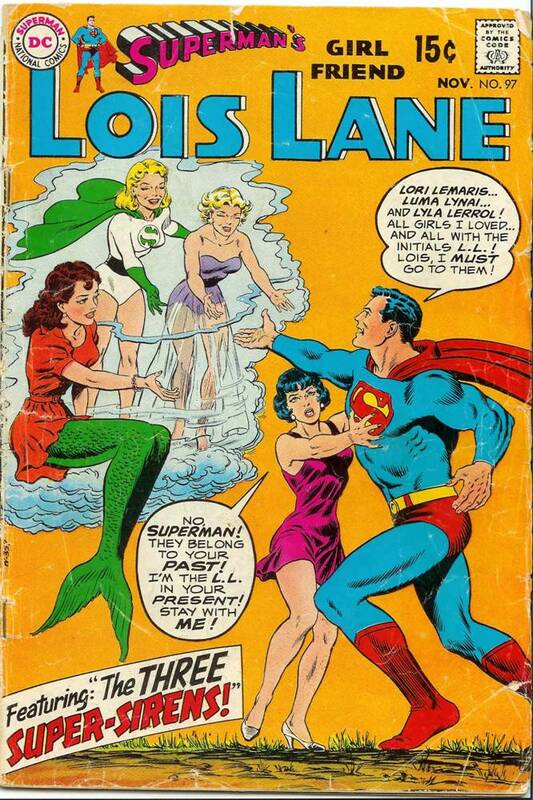 I mean, if you had a choice between a mermaid, a super powered girl with a green cape, or one with a see-through skirt, or Lois Lane in a very short one-piece, who would you pick? Truly a debate for the ages… or for the next time you and your buddies are totally hammered. It ranks right up there with the Ginger or Mary-Anne, or Wilma or Betty questions – questions that just don’t have clear cut answers... <cough> Betty <cough>… sorry, something caught in my throat there. Ahem. Let’s move on. Bummer. 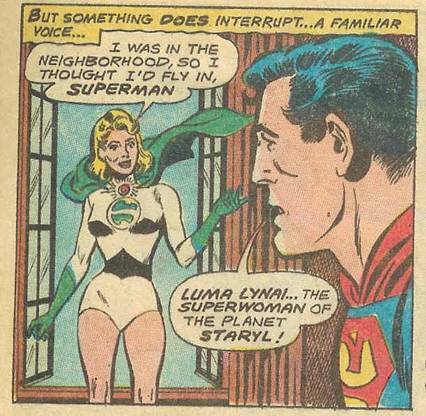 It’s funny how Supergirl – I mean Luma was ready to leave Staryl, the planet she was protecting, at the drop of a hat. 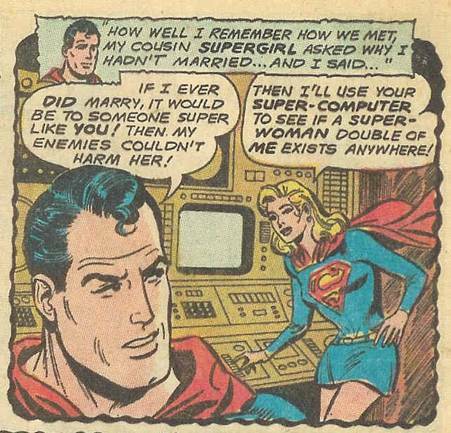 Yet when Superman offers to stay, she just shoos him away. Does that make any sense to you? 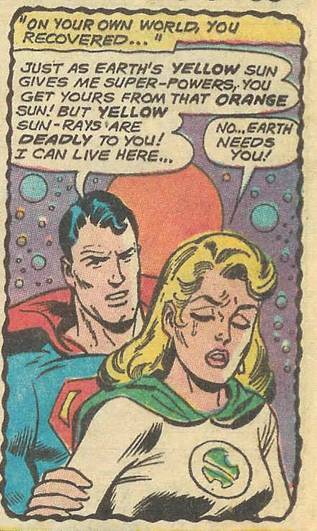 Come to think of it, I don’t know how Superman is able to do so well with a red sun so close to him in the background. One curious aspect is the costume for Luma Lynai. It’s almost like an opposite color scheme to Supergirl’s, which makes me think that maybe Luma is like a backwards, or reverse version, or Bizarro of Supergirl. 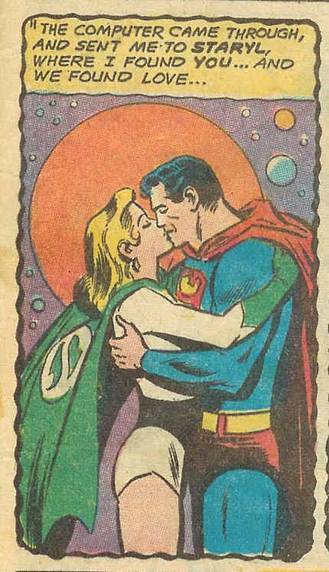 Of course, then her name, when said backwards, should have some significance to Supergirl. Luma Lynai would be equal to, phonetically, I-Anyl, Am U? -L Dang, I wonder who L is?